Pretty much every camera you can buy right now has an exposure compensation option. It's very simple to use and it can be useful across many situations, saving you time in post production and allowing you to get the shot you want with less hassle. Here, we run through everything you need to know about exposure compensation. Exposure compensation is a quick and easy way to bias how your camera responds so that every shot you take ends up with the exposure compensation shift of your choosing. This bias can be set to achieve either more or less exposure than usual, and the result is an image that is either slightly brighter or darker than would otherwise be the case. Exposure compensation works taking what your camera deems to be the correct exposure (based on the metering mode of your choice) and then simply adjusting either the shutter speed or the aperture to apply the change you want to make. The default metering option is Matrix or Evaluative, and this looks at the whole scene and attempts to provide the best balance for everything in it. You can, however, also use exposure compensation when your camera is set to a different metering pattern such as centre-weighted or spot metering. You have complete control over whether this exposure compensation has the effect of letting in more light through to the sensor or less of it, and this is known as applying positive and negative exposure compensation respectively. You also have control over how much compensation is applied. So, you can choose to have just a slight shift towards overexposure, a dramatic shift towards underexposure, a moderate shift in either direction, or any other combination. Most cameras allow you to apply exposure compensation in 1/3EV stops, which gives you fine control over the adjustment, and you will typically have a range of -3EV to +3EV to play with. This means that you can carry on adjusting exposure compensation down to -3EV below and +3EV above what your camera deems to be the correct exposure in a given situation. Some cameras allow you to adjust this in either 1/3EV or 1/2EV stops, and many now give you a broader range of -5EV to +5EV to work with too. So, let’s say you’re shooting in the Aperture Priority mode and your camera deems that the right exposure for a particular scene at an aperture of f/5.6 is 1/100sec. If you apply -1/3EV exposure compensation, your camera will retain the same aperture (as this is what you have chosen to control by being in the Aperture Priority mode), but it will decrease the shutter speed by 1/3EV stop, which changes it from 1/100sec to 1/125sec. If you applied -2/3EV of exposure compensation this would change to 1/160sec, and if you applied -1EV then it would be 1/200sec, as 1/200sec is one full EV stop of exposure less than the 1/100sec setting, which is where you started. It works the same way for aperture when using the Shutter Priority mode. Here, using -1/3EV of exposure compensation would result in the camera using a smaller aperture rather than a shorter shutter speed in order to achieve the same goal. After all, you've chosen to control the shutter speed by using the Shutter Priority mode, and here, you would go from f/5.6 to f/6.3. Similarly, -2/3EV stops of exposure compensation would bring this down to f/7.1 and -1EV stop would bring it down again to f/8. Don’t worry about remembering these figures, as the camera does all the work here. The way you access exposure compensation depends on the camera you’re using. 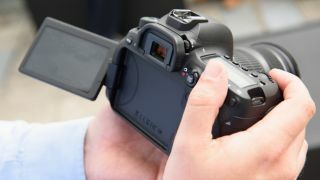 On many cameras, such as Nikon DSLR bodies and more junior Canon DSLRs, this control usually looks like a plus and minus icon positioned inside a square that's divided diagonally into two triangles. You just hold it down and move the relevant dial until you've applied the compensation you need, or press it and select the option you want on the rear LCD screen. On other cameras, it’s simply applied by turning a dial when shooting in a particular exposure mode. Many enthusiast- and professional-level Canon DSLRs, for example, have exposure compensation accessed through a simple turn of the Quick Control Dial on the rear, when shooting in a relevant exposure mode such as Aperture Priority. You can use exposure compensation in Program, Aperture Priority and Shutter Priority exposure modes, but you will not be able to use it in Auto or Scene modes. It’s also not available in the Manual exposure mode as you have full control over shutter speed and aperture at all times anyway. Read more: What are the differences between the PASM exposure modes on your camera? Exposure compensation is useful across a broad range of situations. Some cameras tend to produce brighter or darker exposures quite easily, so using a modest amount of exposure compensation lets you rectify this. Many cameras are designed to protect highlight details from being lost, and so they will naturally produce slightly darker exposures in many situations to stop this from happening. Using exposure compensation adjusts for this behaviour so that the exposure is more in line with your expectations, though potentially at the expense of some highlight information. It could also be that your camera doesn’t quite understand what’s important in the scene and consistently meters it so that a specific part of it is slightly darker or lighter than you need it to be. This is often the case when the subject of your choice only occupies a small part of it. Here, you can also use a different metering mode such as spot metering, although many photographers find it more practical to simply adjust the exposure compensation instead. Your camera may also be fooled by very dark areas or bright highlights, which makes it believe that scene needs to be exposed in a different way to the way you prefer. Some images, particularly those taken in high-contrast situations, can become more dramatic when you severely underexpose, all the while keeping an eye on the very brightest parts of the scene. Indeed, most of the time you may simply be using it for creative reasons more than anything else. In the above example, the camera naturally overexposed the shot as it was faced with an abundance of shadow detail and was looking for a good balance overall. By using negative exposure compensation, the subject could be rendered in silhouette against the brighter background details, but the scene is still balanced as the brighter parts still record as a highlight.